Since 1975 O.M.A ltd is specialised in building and selling agricultural machinery. 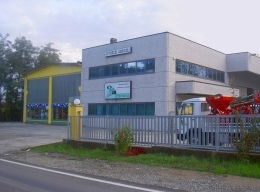 The firm is located in Alice Bel Colle, very close to two small town in southern Piedmont, Acqui Terme and Nizza Monferrato, and easily accessible from Genova and Turin. O.M.A. ltd sells vineyards equipment like sprayers, dusters, lift and hoes. The firm sells ribbon saw and log splitter too. The selling is directly managed or handled through a nationwise and European dealers network. O.M.A. ltd actually satisfy the European community regulations (CE label). Every machine produced can be customised, adjusted and modified to satisfy every customer requirements.